Burning neuralgia is a tricky beast. I have referred to it as a dragon at times, and that description still seems apt. You may have weeks of good days, where the burn is barely noticeable and doesn’t intrude terribly on your life, only to have a string of days that make you wonder if it is worth going through this day after day. Sometimes I am able to discern the cause or trigger (dryer than normal air, dryness from meds, and stress are three of mine) but sometimes I can’t, and I think that is more difficult to deal with. Sharing your feelings, your coping strategies, and the information you learn along the way in this burning journey seems to help, and I encourage you to connect with fellow sufferers and check into the Burning Mouth Support website. If new information comes out, it will be there! Check in on Facebook for a group that might be of help, but be aware that many folks may be in what I call the “thrashing stage,” where a lot of incorrect information and quack remedies can be tried and mistakenly recommended. Use your discernment and be patient with them as they find what actually works and start to develop constructive coping strategies. We only have each other and our medical specialists to turn to, and as many of you have discovered, we are often teaching our doctors about a pain syndrome they have not encountered before. Keep communicating and my prayers for relief and cure are with all of you. There, I feel better already! 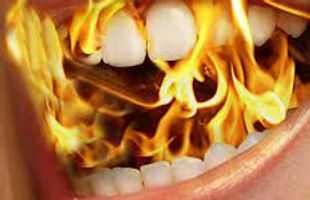 ← Cannabis for Burning Mouth Syndrome?